According to Adrian Wojnarowski of ESPN, the Lakers have signed Travis Wear of the South Bay Lakers to a 10-day contract. Here’s everything you need to know about the 27 year old UCLA product. Laker fans will remember Travis Wear from being part of the championship Summer League squad. He’s a power forward, but his role over those 8 games was to spot up (27 points on 22 possessions), pick and pop (8 points on 4 possessions, and knock down shots in transition (14 points in 14 possessions). He shot 42% from deep and was 6/10 on contested 3s. It was a small sample, but was quite a performance from Wear, who exhibited his ability as a floor spacer. On a much larger sample in the G-League this season he’s also been impressive. He’s 28/49 on open catch and shoot 3s, 57%, as well as 34% on contested ones and 42% on off-the-dribble 3s. The dude can shoot. He’s 6’10”, but is in no way a post player. In fact, he’s only had one more post up than pick and roll ball handler possession (and has been more effective in the pick and roll). He has 25 post ups in 33 games, but his efficiency is only better than 25% of the G-League on those attempts and his statistical profile shows an easily scoutable and very limited repertoire of moves. He’s used 1 drop step, 0 hook shots, and 0 up and unders in his post possessions. He doesn’t exactly keep the defense guessing. I don’t expect much usage or production from him in the post. Where he likely will be used is as a spot up, floor spacing shooter. It’s been his top play type everywhere he’s been, and he’s been great at it. And he isn’t just a catch and shoot guy. He’s shown an ability to dribble into a pull up and even take the ball to the rim to score efficiently. About 60% of Travis Wear’s offense is generated between those spot ups and Wear’s transition attempts, where he’s been a rim runner and 43% 3-point shooter. The remaining 40% is split up between about 5 play types taking up ~5% of his offense and then his pick and roll/pop game. Wear’s points per possession is in the 95th percentile when he’s picking and popping, a skill set that will fit in with what Brook Lopez, Kyle Kuzma, and Channing Frye bring. Wear is 6th of 11 players that has played in 20+ games for the SBL in net rating. The team’s offense has been about 2 points per 100 possessions better with him on the court, and the defense has been about 2 points worse. Wear’s individual defensive statistics aren’t flattering as a primary defender. His largest area of weakness is as a spot up defender, where his positioning gets him in a ton of trouble. Take a look at the diagram below. When the ball is in the corner, the proper positioning for the defender of a player in the opposite corner that you learn in your “shell defense” is to have your head under the rim. If your man is a shooter, maybe a step closer. The idea is to always be in the best position to help, but also to recover to your man in time if a pass goes to them. 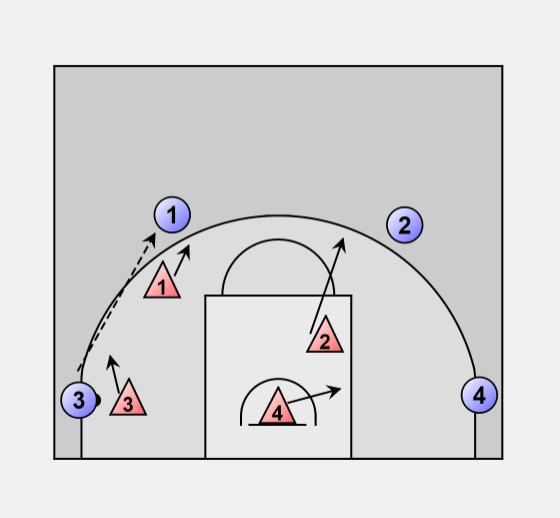 From corner to corner, you’d have more time, leading to being further over toward the ball. Wear would be 4 in this diagram. But when when the ball is reversed back up top or a drive is made that’s more toward the elbow than the rim, 4 needs to get closer to his man, since the pass to his man is a quicker one. They should typically go to around the lane line, but closer if your man is a better shooter. Travis Wear’s issue defensively is he’ll get in this under the rim position, but then won’t adjust when the ball moves, leaving him out of position to contest shots when the ball gets to his man. This has led to more open shots (2nd most of any SBL player) and desperate closeout attempts. And the data lines up with the film. Wear is in the 19th percentile on catch and shoot defense in spot up situations and 9th percentile defense on pull ups. If you aren’t the most fleet of foot, you need to use IQ and positioning to contest shots to contain your man. Wear struggles with that, and it hurts him and the team defensively. This is an easily fixable issue, so hopefully the coaching staff identifies it in practice. Other than that one component, Wear is average everywhere else by the data except for in the post. In those possessions he’s been effective on a small sample. When we go deeper, Wear has been in the 35th percentile defensively in isolation mismatches. This is part of the SBL game plan defensively, and provides insight into how Wear may fare on the parent team in similar situations. Overall, Wear won’t be adding much to the Laker defense but also doesn’t look like a liability. His off-ball positioning will just need to improve. Travis Wear is another PF, so how does this affect the rotation? 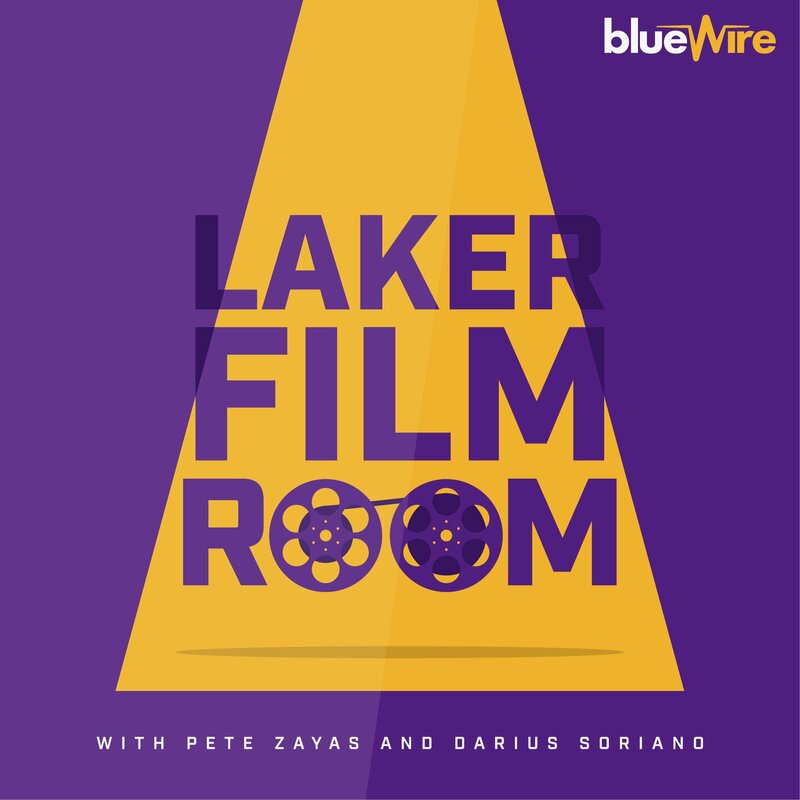 Darius provides some great insight: With Josh Hart being out, we saw Kuzma play SF in big lineups while Ingram played PG next to KCP. I’d imagine Wear being brought on makes those lineups more of a possibility moving forward, and he would be insurance at PF in rotations where Kuzma/Ingram tire, get in foul trouble, or get hurt (like Ingram’s flexor strain). I think Darius’ is spot on with his assessment. Wear likely won’t get much time on the court in normal situations if everyone is healthy. But when something goes wrong, he’s a good option that can space the floor off the bench that’ll hit open shots. His defense won’t be a difference maker, but it also doesn’t appear as though it will be a major concern. Wear look like a good signing for LA.